TorontoMulticulturalCalendar.com is about Toronto’s free or almost free multicultural festivals and events. Can we set a goal of giving every Torontonian a feeling of being part of one big multicultural community? Can we do this through a direct experience of each other’s events and interesting architecture? TorontoMulticulturalCalendar.com will cover food, performances, and markets at as many events as possible. What are your favourite ethnic festivals, musicians and dancers? Please tell us what’s happened to you at these festivals. Give us tips on how best to enjoy these celebrations. Let’s experience the cultures of the world in Toronto. Let’s make some friends among Toronto’s diverse residents, and show our many different groups by our physical presence that other Torontonians do care about them. Please don’t just “friend” them on Facebook. I’ll try to remind you of upcoming events on www.Twitter.com/TorontoMulticul and lets you know about a few dates at www.TorontoMulticulturalCalendar.com . Please send us information about ethnic events I’ve missed, ones you want to share with other Toronto residents. E-mail your comments. Let us know if you want to volunteer your technical expertise, help with our expenses, or come with us to festivals for a stimulating time. My email is: ruthlormalloy@gmail.com. Our thanks goes to Ian Mah and Ida Jagaric for their invaluable help in setting up this blog and our web-site calendar. Thanks also to Lucy Izon, Francisca de Zwager, Judy Wark, and my husband Mike Malloy for their sage advice. 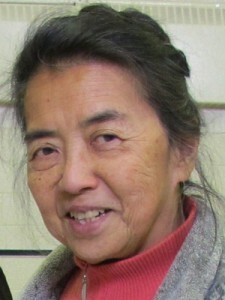 Ruth Lor Malloy is behind TorontoMulticulturalCalendar.com. She is a travel writer and photographer, born in Canada with an obsession to experience the whole world. She was brought up in a Chinese restaurant family in eastern Ontario, and has lived for extended periods in the U.S., the Philippines, Hong Kong, Vietnam, Kazakhstan, India, Taiwan, and Thailand. She has also lived in Japan, Mexico and Brasil. From 1975 to 2002, she published a series of 14 guide books on China. She has also published guide books on Beijing and Hong Kong, and helped with one on Almaty. Her self-guided, downloadable photo tours on the Calgary Stampede, the Quebec Winter Carnival, The World in Toronto, and Toronto’s Many Chinatowns are available from VisualTravelTours.com. This company has also published her tours on Botswana, Mongolia and Helsinki. While you primarily aim to acquaint local residents of Toronto with the many colorful multicultural events you report on, why not let visitors to the city in on the fun, too? Maybe link up with the city’s tourism folks so that visitors might know about these authentic observances when they’re in town. In any case, good luck with spreading the word about all these events. I’m signed up for the blog. Good to have notice of these events for my trips to Toronto! performing again near Toronto. Ruth. I’d like to speak with you about parntering with the City’s culture blog, LiveWithCulture.ca. Please reply to the email indicated. Would be delighted to have you cover this vibrant festival. very cute. There’s a nice neighbourhood feeling too. It was wonderful meeting you at the GTA Eid Festival! and will try to do so again this year. Please let us know about Christmas Around the World too. It was excellent last year. Ruth. Hello! I feel like I hit the motherload of ethnic event websites! I work for a marketing agency, and I am currently complying a list of upcoming ethnic events (mostly Chinese and South Asian), I would greatly appreciate and love your help in creating this list since you seem to be very much in the know. Please feel free to email me. Hi Kelly, Many upcoming events in the Chinese and South Asian communities are on http://www.TorontoMulticulturalCalendar.com as soon as I learn about them. I only mention free or nearly-free events and usually give a telephone number or web-site for more information. I think it would help if you looked at my 2011 list as dates for 2012 from the end of March are not yet available on my site. In some cases, I haven’t had time to post them. For religious events, look at the Interfaith Calendar: http://www.interfairthcalendar.org. For Indian dates, try: http://www.timeanddate.com/calendar/?country=35 . I have found dates of events for other countries on the web too and then had to do some phoning for the addresses and times. You might also want to look at: http://calendar.retira.eu/public-holidays/worldwide/2012/. Again, you might have to follow up with telephone calls. I hope this helps. Ruth. a lot of names, addresses and telephone numbers and statistics — by countries — but not all countries. Ruth. Hello Ruth ! I admire you for everything that you have done in your life…!!! especially watching you bring the rich multicultural community of Toronto together in creating an atmosphere of oneness !…Congratulations !!! My daughter would love to participate as a Greek traditional singer who plays the lute, in the upcoming festival ! She would love to hear more about participating in the multicultural festival in June ! Thank you for everything that you offer to all of us, in this great city of Toronto!!! Hi Issidora, Many thanks for your generous comments. I only blog about events; I don’t organize them. My blogs usually give a website contact. Please go to organizers who might be interested in a Greek traditional singer. These don’t have to be Greek. Neighbourhood multicultural festivals or Greek churches might be interested. This means a lot of research for you. Click on the magnifying glass at the top of my blog and type in “Greece,” or “Multicultural”. These events will be listed there. Good luck. Ruth.